The Garden Centre was once again transformed this weekend with the arrival of our range of Locally Grown Hanging Baskets. These beauties are absolutely packed with plants, including Petunia, Lobelia and Verbena which are all grown right here on our lovely Island. The range includes huge 16" wire baskets for making a real statement, or there are luxury banana leaf and rattan cones and wall baskets. Each basket has slow release plant food in the compost, so all you have to do is water it regularly to get the most of your display. We can also deliver your baskets to your house for you, or maybe it would make an ideal gift for someone? Well, we can tie it with a ribbon and deliver it to them too! 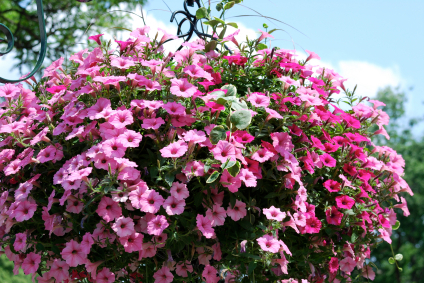 We also offer a planting service for you to use if you have any baskets from last year that you would like re-filling. Let us know what colours you like, and we will do the messy bit for you, using only the best quality, locally grown plants that we can find. Call in to the shop or give us a ring if you would like more information.